Walking up a smooth, well-worn stone staircase to Sanbutsuji Temple, I instantly hoped the whole trail up Japan’s Mount Mitoku wasn’t going to be this steep. Looking back now, that was the easiest part of hiking Mitokusan. My adventurous hike (or should I say climb) up Mount Mitoku began simply enough. I met with the monk’s son, who would be my guide for this hike, and took a quick look around the temple buildings at the base of the climbing trail. Standing in front of the Hondo, Sanbutsuji temple’s main hall, I went through the rituals. I tossed a coin into the box, rang the bell, placed my palms together and bowed my head. I prayed that I survive this day. See, I had heard this hike is kind of wild. It’s so challenging in fact, that traditionally only monks undergoing spiritual training embarked on this route. How could a hike be spiritual training? I wondered. I have never done a hike that required more careful thinking than this one. As I crossed the Yadoiribashi bridge into a forest of 1000 year old cedar trees, my mind cleared and my body relaxed in preparation for the challenging road ahead. I was ready to tackle the climb in front of me. I had my climbing shoes on (I declined the traditional straw climbing sandals), a bottle full of water and the customary sash for good luck draped across my body. I was even wearing the white climbing gloves with the yellow-gripped palms you get when signing in at the office. Warazouri, traditional straw climbing sandals. At first I felt ridiculous wearing thick gloves when it was 35°C and sticky from the humidity. Yet, a few moments later, I was grateful for my climbing gloves, and my lucky charm sash. The path I was on had disappeared, swallowed up by a tangled knot of thick tree roots. Carefully placing my feet on the slippery wood, I bent down and used my arms to help pull me up, as though I was climbing a ladder. At the top of the ridge, the path returned but only for a brief moment. Once again, I was carefully contemplating where to step, which opening amidst the maze of roots was best to jam my foot inside, for maximum stability. On and on the adventure went up the Kazura-zaka (Kazura slope), until the trail returned to firmly packed earth. But it wasn’t easy going for long. Looking ahead I could see a rugged stone path and I knew we were getting close to the section of trail I had heard so much about- the Kusari-zaka. This rocky path is so steep that you have to climb it by holding onto a chain, just like the pilgrim monks used to do. There were a few moments before this point that I felt nervous, but this was the first time on Mount Mitoku I was gulping down fear with every breath I took. “I’m scared I’m going to die!” I called out to my travel partner who was already at the top. I had watched his movements, studied his path, but still I was unsure. As the rest of my hiking group was coming up behind me, I didn’t have much time to hesitate. So, I just went for it. I wrapped both my hands around the chain and took my first few steps. Immediately, I was startled by the weight of my camera backpack pulling my body further from the rocks. I tried not to think about how scary this was, remembering instead how important it was to concentrate. I climbed a few more steps using the chain then reached out to the scaffold of Monjudo Hall for extra support. Feeling safer, I pulled my way to the top of the precipice. As I watched the rest of my group come up the chain, I felt so good knowing that the hardest part of the climb was behind me! And the best was yet to come. After all that excitement, it was time to take a well-deserved rest at Monjudo Hall. Removing my shoes, I stepped onto the wooden terrace and walked along the narrow perimeter of the first wall. Reaching the end of the wall, I turned the corner and gasped. Wow- what a view! Stretching out for miles in front of me was a valley so lush, packed thick with a variety of trees that I couldn’t do much else but stare. I instantly forgot about how hot I was, how my eyes were burning from the salty sweat dripping into them, how completely soaked my clothes were. I had earned this view. I could have sat there all day, dangling my feet from the edge of this ancient hall. Yet, as good as the scenery was, there was an even more esteemed spot waiting at the end of the trail. And so I trekked on. Climbing higher still, on trail sections named the Horse Back (Umanose) and Cow Back (Ushinose), I passed by the cliffside Jizodo Hall, a handful of other wooden temples and a large bell that every climber strikes before proceeding. At Kannondo, the trail entered into darkness, curving behind the temple that was partially wedged inside a cave. Before passing through, I was told to put my hands together in front of me, as though praying at a temple, then point them forward as I walked behind the building. It’s a ritual that symbolizes being reborn, moving through a mother’s womb. Coming out the other side is a new beginning. It’s strange, but I did feel rejuvenated, even though I looked like I was melting. It wasn’t much further until I saw what I had climbed over rocks, grasped onto tree roots and pulled myself up on a chain to see. Nageiredo- the inner hall of Sanbutsuji Temple. This simple structure looked so elegant and delicate, dangerously clinging to the side of Mount Mitoku. As I looked at Nageiredo’s perilous location, I started to wonder how it could have been built there. It seemed almost illogical that a building could stand only on wooden stilts, resting on nothing more than a groove in the rocks, for over 1000 years. As the story goes, En no Gyōja, a Japanese ascetic, mystic and founder of the Shugendo religion, used his supernatural powers to throw Nageiredo onto the cliff face. It was this magical act that gave the hall its name- Nageiredo means “thrown-on temple”. An interesting story, I thought, but I’ll still consider Nageiredo’s construction a mystery. For a few minutes longer, I stood there and admired this national treasure, a sublime example of Heian period architecture. Groups of climbers clamored to have their photo taken in front of Nageiredo, but I barely noticed. In that moment it was just me, Mount Mitoku and a renewed belief in the idea that hard work, and a good challenge, brings the most satisfying rewards. Here’s a short video of my hike on Mount Mitoku. Getting to Mount Mitoku: Mount Mitoku is in the Tottori prefecture of Japan, near the hot-spring town of Misasa. From Misasa and Kurayoshi, you can take a bus heading to Mitokusan or Yoshihara (get off at Mitokusan stop). Should be about a 15 minute ride from Misasa and 30 minutes from JR Kurayoshi station. Admission fees: To enter Sanbutsuji Temple, the price is ¥400. 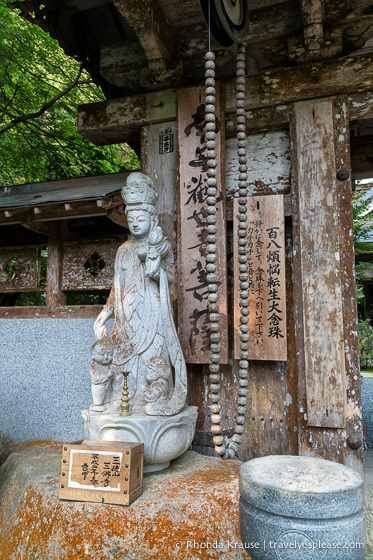 To climb to Nageiredo, it’s an additional ¥200, payable at the climber’s office, past the main temple. So, all in the experience costs ¥600. Operating hours: The temple area near the base of the mountain is open from 8:00 am- 5:00 pm. The climb to Nageiredo is open from 8:00 am- 3:00 pm. The trail is closed on rainy days and in the winter. Climbing/hiking gear: You must wear hiking boots or running shoes with good grips. The staff will check the bottoms of your shoes and if they deem them unsuitable, you will have to purchase and wear the straw sandals. I didn’t try the sandals, but my travel partner did and said they were excellent for climbing because they allowed his feet to bend over rocks and uneven terrain, providing more grip and stability. To preserve the trail, hiking poles/walking sticks and shoes with metal spikes cannot be used when climbing Mount Mitoku. Bring bug spray because there are mosquitos. Carry a small towel to wipe the sweat from your forehead. Everyone had one…except for me. Climbing safety: You must climb in groups of two, minimum. If you are travelling solo, you will have to wait until other hikers arrive. Facilities on the trail: There are no restrooms, water stations or places to purchase food on the trail, so make sure you bring what you need and pack out your garbage. Climb time: Climbing Mount Mitoku, to Nageiredo and back, takes about 1.5 hours. There’s a 200 metre altitude difference from the Yadoiribashi bridge at the start of the trail to Nageiredo. After the climb: Trust me, it will feel so good to refresh in an onsen after hiking Mount Mitoku. Misasa Onsen is the perfect place to do this. Prices and hours were correct at the time of publishing but can change without notice. Please confirm directly with service providers. The best place to stay if you plan on climbing Mount Mitoku is in the hot-spring resort town of Misasa. It’s only about 15 minutes from the mountain and has many ryokan (traditional Japanese inns) you can stay at. For your convenience, here is a list of hotels in Misasa. Please consider booking your Misasa accommodations through the included link. It costs nothing extra and helps support this website. Thank you! I’d like to thank the Tottori Prefectural Government Tourism and Exchange Bureau for hosting me in order to bring you this story. As always, I speak only the truth and hosts have no editorial influence on articles. Snowshoeing in Jasper- Our First Experience and Why You Should Try it Too!